Every year, taxpayers dole out more than $7 billion to subsidize farmers, insurance agents and insurance companies – up from $1 billion a few decades ago. Here are the top five reasons to reform this bloated program. 1. Some farmers collect more than than $1 million a year. Unlike commodity subsidies, which are subject to a $125,000 payment limit, there is no payment limit on crop insurance subsidies. So, dozens of farmers receive more than $1 million in crop insurance premium support and thousands receive more than $100,000. 2. 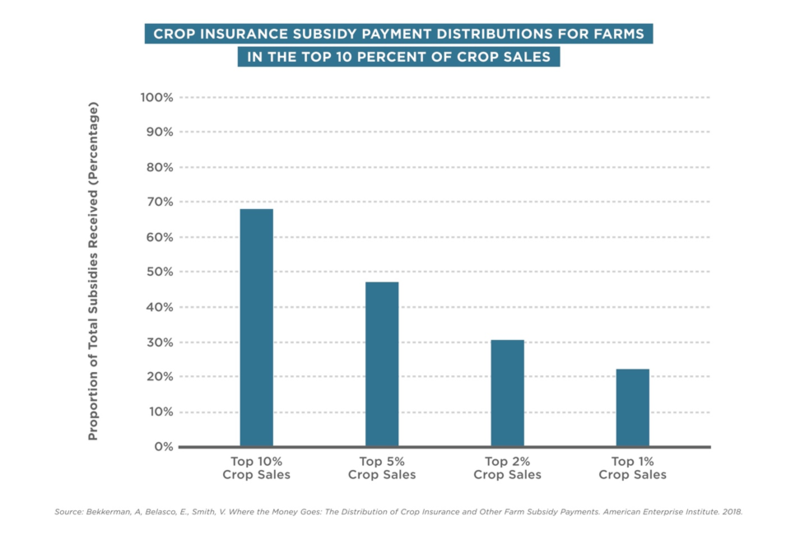 The top-selling 10 percent of farmers receive almost 70 percent of all subsidies. Because there is no payment limit, the largest farms, when measured by crop sales, receive the lion’s share of farm subsidies. Meanwhile, the bottom 80 percent of recipients get about $5,000 a year. 3. Billionaires remain eligible for crop insurance subsidies. Unlike commodity subsidies, which cannot be paid to farm couples with more than $1.8 million in adjusted gross income, there is no means test for crop insurance subsidies. Billionaires who own farms – like Paul Allen, Charles Schwab, and Richard DeVos – remain eligible for crop insurance subsidies. 4. Insured farmers receive $2 for every $1 they spend. Crop insurance premiums are so heavily subsidized that participating farmers receive $2 in indemnities for every $1 they spend to share the cost of premiums. 5. But, most farmers don’t participate, especially minority farmers. 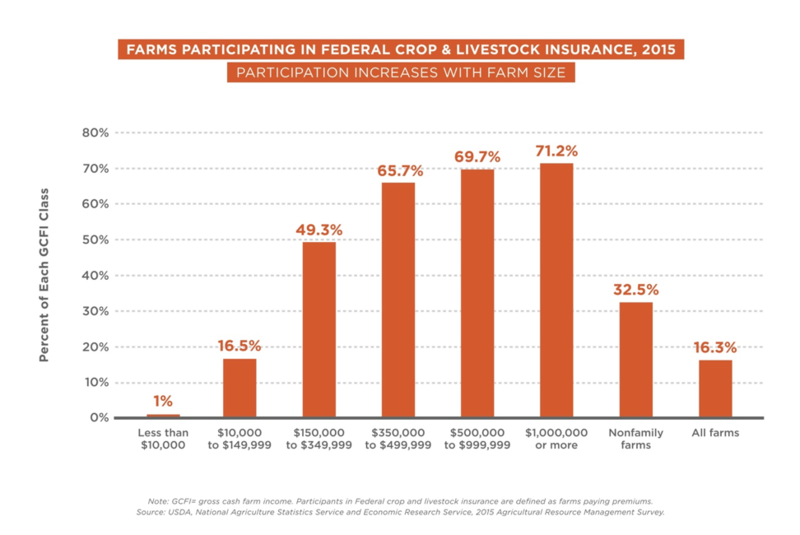 Only 16 percent of all farmers participate in the crop insurance programs. Many farmers do not grow the right crops to be eligible or are small farmers who can’t afford to pay their share of the premium. Subsidy reforms proposed by Sens. Richard Durbin, D-Ill., Chuck Grassley, R-Iowa, Jeanne Shaheen, D-N.H., and Jeff Flake, R-Ariz., would help make the crop insurance program fairer to farmers and taxpayers by reducing premium subsidies by 15 percent when a farm couple has already made millions in the marketplace. Specifically, they would reduce subsidies for couples with adjusted gross incomes of more than $1.4 billion. They would also cap crop insurance subsidies at $125,000 – just like commodity subsidies. These reforms have been endorsed by everyone from the Congressional Budget Office to the Government Accountability Office. Reforms like the Durbin-Grassley means testing amendments would only impact a few thousand farmers, so they would have no impact on the price other farmers pay for their crop insurance, according to UDSA economists. But, they would level the playing field for other farmers and earn this bloated program more support from taxpayers.